Yes, LG 4K Ultra HD TV gives amazing movie/video enjoyment. But, there is a problem which should be handled. How to rip and stream DVD movies to LG 4K Ultra HD TV? First of all, we should learn the video format compatible with LG 4K Ultra HD TV. Since all the LG Smart USB interface is 2.0, according to USB 2.0 supported format below. In addition, HEVC codec is supported by LG 4K Ultra HD TV allowing for 4K UHD movie/video playback. Step 1: Insert your DVD disc into computer’s DVD-rom and then launch the DVD Ripper. Click “Load file(s)” button to load the movies from your DVD discs. 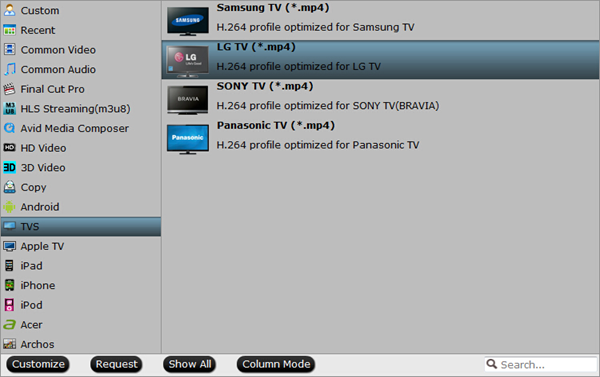 You can also import ISO files, IFO files or DVD folder (DVD folders files name appear like “Video_TS”) for conversion. 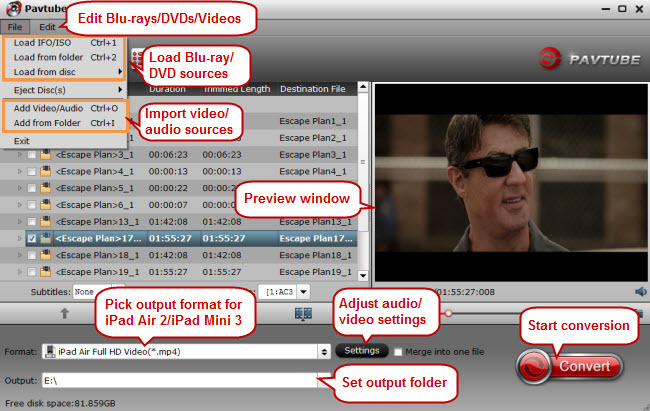 Step 2: (Optional) Once the files are loaded, you can select the subtitles and audio track you prefer. On the right windows, you can preview your files and take snapshots of your favorite movie scenes. Step 3: Click the “Format” bar and follow “TVS > LG TV (*.mp4)” for LG 4K Ultra HD TV. Step 4: Advanced Settings – Click the “Settings” icon, and you can adjust codec, bit rate, frame rate, sample rate and audio channel in the interface according to your needs and optimize the output file quality. For DVD movie source, there’s no need for compressing(It is relatively a small file size). Just keep the video size as original (720 * 480). And upscaling the video size won’t make any difference of your video quality. Step 5: When everything is ready, hit the “Start conversion” button to start ripping DVD to LG 4K Ultra HD TV. After finish all the tasks, open output folder, and find ripped DVD movie. (1) If your TV supports USB port, copy the ripped DVD movie via flash disk or mobile hard disk to be played on TV. (2) If the TV comes with its own Android system, you can use the Android software to transmit/synchronize the DVD movie wirelessly. (3) If you have an intelligent router (with hard drive) at home, copy the ripped DVD movie into the router, and then TV can directly read the digital video. Like AirPort Time Capsule by Apple. Now you can freely watch DVD movies on LG 4K Ultra HD TV without DVD player. Just try and enjoy. Don’t forget get the DVD ripper software below. Why can’t I watch MP4 on TV? How to Play MKV on Amazon Fire TV?